We refer to Living Film with respect to the reversibility of the terms: film as object that is activated through physical contact and film as an ongoing mode of material practice that shapes the consciousness of, animates and enlivens its makers. Thorsten Fleisch, Germany. 1999. Blutrausch, 16mm - optical sound. 4:15 minutes. 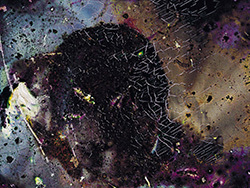 The film is an attempt to constitute a human/machine dialogue. It shows the filmmakers' blood as seen/heard with the eyes/ears of the machine which is a film projector with optical sound. The filmmaker affixed his blood onto transparent film leader. 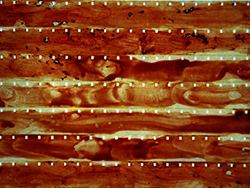 This was achieved by cutting into the flesh and then pressing the film leader into the wound. It was also done by having blood taken by a nurse with a syringe and afterwards dripping blood on the film leader. It was done with fresh and with clotted blood. The end of history here refers not to Fukuyama's doctrine but to the nature of blood in the female body which creates a monthly cyclic time-clock and has a finite endpoint. In contrast to Fleisch's film, requiring an incision/s to produce the medium, this film is made with the natural emanation from the body. Questions remain about blood's common visual resonances in the two films and if it reveals any gendered specifity, as this is essentially the common substance giving life and breath, before decaying in death. 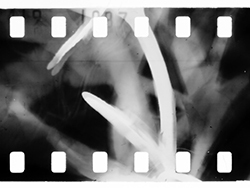 From Smiths' series 'physical' films, using full body advance upon commonly found manual methods for making films without cameras. 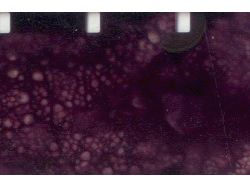 Physical stains are hosted by film as it absorbs and holds juice and saliva in its gelatin skin. The soundtrack is similarly structured, so as measured licks explode into random spits, the metric rasping noises burst into a clamour of 'speech'. Film is made more physical, while the body moves mechanically; the trace of bodily flows and pulses joined to the films' beat generate distinctive rhythms. This is a continuation of pinhole work whereby whole lenghts of film are exposed simultaneously in a non linear configuration. In this film a lenght standard 8 film is draped in and around a rosemary bush. Some of the film touches the leaves and stalks, other parts do not. The form of the subject is represented on the film in a near 1:1 scale. When projected the subject is broken down into sequential frames presenting a durational representation of the rosemary bush. 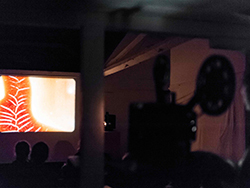 A 16mm film based on manipulating a barcode to play scales of tones. 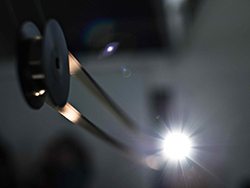 The barcode makes sound as it passes the photoelectric cell in the film projector. This shows a direct connection between the sound and the image. What you see is what you hear. 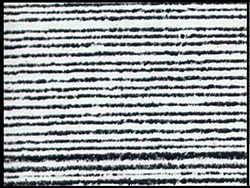 By having glued on a barcode in different sizes, the barcode plays over a range of two octaves (from low to high C). 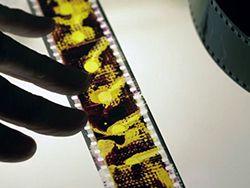 The film was originally used in an installation entitled Composition for a film projector, barcode and spotlight. Priya, observes from overhead a woman in a rapturous dance. The woman's white dress swirls in the air as her raised arms circle past the screen, setting the steady pace of her dizzying, hypnotic whirl. Loud colours and lights pulsate over her in an unmitigated frenzy, suggesting the ecstatic vertigo that she feels in her dance. The 16mm film has been buried in Syed's garden, wrappedd in combinations of leaves, earth and biodegradable waste. This collaboration with nature and time has contributed and erased, producing the unexpected. The original was shot in 1980 with John Briscoe who performs in these short sequences. The title and idea for this film originated from a photograph by American photographer Ralph Morse, the image of a child in a cowboy outfit playing at being shot, with the caption "Blisfully Gunned Down". 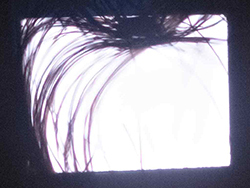 The performance with the film is an attempt to orchestrate and animate a synchrounous and diagetic sound event on the optical track of the film - to score the film live and reinforce the visible source on the screen as the sound gradually becomes present throughout the filmed action on the screen. Photograms of the ingredients of four dishes, which form the following menu: alphabet soup, goulash, kaiserschmarren (typical Austrian dish: sugared pancake) and coffee. The movie is made in the darkroom without a camera. The ingredients affect the film as they affect the stomach, e.g. the egg turns the B&W film yellow. The cooking activity is abstracted onto the film, the ingredients appear as they are during cooking. 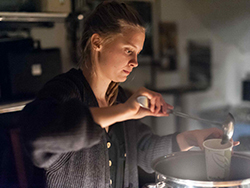 During the expanded cinema experience the menu of Foodfilms is cooked and served after the screening. Kayla Parker, UK. 2013. Her Dark Materials: Conjuring the Feminine Imaginary. HD video. 15 minutes. Video essay which reflects on the artist's engagement with materiality and the materials of film-making, Includes extracts from direct animation artworks, documentary 'making of' material, and documentation of live performance with film.Filmed and edited by Stuart Moore; production: Sundog Media. James Holcombe & Adam Asnan, UK. 2013. Hair in Gate. Performance. 10 minutes. 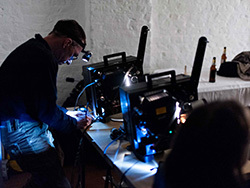 The performance exploits the film's normally hidden or unwanted aspects of projection and chance, highlighting the act of cleaning the projector's gate for it's performative qualities. For this performance, hair and fluff will be intentionally and directly applied to the gate of the projector, made visible on screen until removed and cleaned by the projectionist in real time, using saliva. The amplification of human gesture and movement and the articulation of a series of actions only used to project photochemical film lie at the heart of the piece. A line of film threads across the room and loops back to the machine, the filmstrip creating an audible drawing that resonates through the space. Move close to the body of the projector and you will hear the whisper. Meanwhile, another projector cast into the stairway intones a line of enquiry as the tight loop of filmturns into the machine again and again. 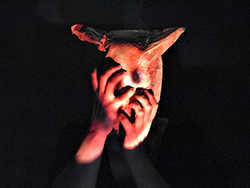 Performance and installation photographs by: Luke Pickering, © 2013.